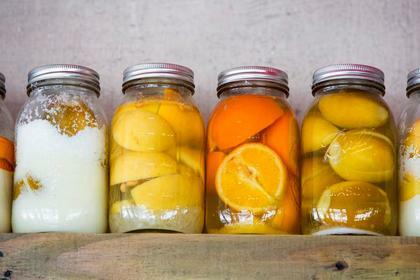 Yes, we too are guilty of the mason jar obsession. While we aren’t using them for rustic chic decor, we have fallen for the practical aspects they were originally created for. We try to avoid plastic containers wherever possible, due to the harmful chemicals in plastics that leach into our food, especially liquids. Glass mason jars are the perfect vehicle for storing soups and sauces safely. Today’s kitchen tip centers around using them for freezing. Run the jars and lids through the dishwasher and drying cycle to sterilize them. Place the ingredients into the jar leaving at least an 1″ or so at the top to accommodate expansion as the liquid freezes. Place the lids on the jars loosely, and allow the soup or sauce to fully cool. Once cooled, tighten the lids and place them in the freezer. Glass jars can also be safely microwaved, for those times when you don’t have access to a stove. Make sure to remove the metal lids before doing so. This entry was posted on September 30, 2014 at 6:59 am and is filed under Food. You can follow any responses to this entry through the RSS 2.0 feed. You can leave a response, or trackback from your own site.